The UK is not on track to meet its 2020 renewables targets. Heat networks have huge potential to contribute towards the UK’s Climate Change goals, as well as helping to address fuel poverty. Considerable Government support has been aimed at encouraging the installation of new networks, with £320m identified for spending through the Heat Networks Delivery Unit (HNDU). However, many existing installations remain dormant or are performing suboptimally, with experiences of poorly-designed systems undermining networks’ reputation for reliable, low carbon, cost-effective and comfortable heat. 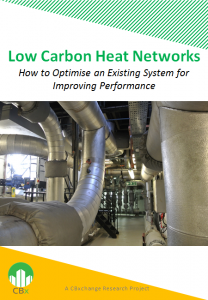 The CBx Research on Low Carbon Heat Networks investigates the efficiency barriers around existing heat network operation. With a steering committee comprised of industry leaders including Skanska, Willmott Dixon, Hilson Moran, Catalyst Housing, Buro Happold, Sustainable Homes and a forward by Dr Alan Whitehead, MP, CBx has drawn together the contribution of experts and heat network stakeholders into an evidence-led guide. Recommendations centre around technical, contractual and behavioural changes, with a focus on cost-effective interventions to deliver real performance improvement.